You probably don’t think much about your home’s ductwork and ventilation system, but it plays a key role in keeping your home comfortable all year round. Specifically, the ductwork in your home works to efficiently carry warm and cold air from your HVAC system directly to your vents. However, like all HVAC components, ductwork will eventually need to be replaced. Over the years, wear and tear can prevent the ductwork in your home from doing its job efficiently, which could lead to higher energy bills and an uncomfortable living space. While the only way to know for sure that you need a ductwork replacement is to have a qualified HVAC technician come and take a look at your home, there are some “telltale signs” that you can watch out for. Poor indoor air quality can lead to a host of problems. The dust and other debris floating around the air in your home could harm your respiratory health—especially if you already suffer from asthma or allergies. You may also find that you need to dust your home all the time because there is always a layer of dust settling on the surfaces throughout your home. If this sounds familiar, your poor air quality could be due to bad ductwork. Specifically, ductwork that has developed leaks or that has a poor seal can cause excess dust and debris to be released into the air you breathe. At the very least, you should look into having your air ducts professionally cleaned. 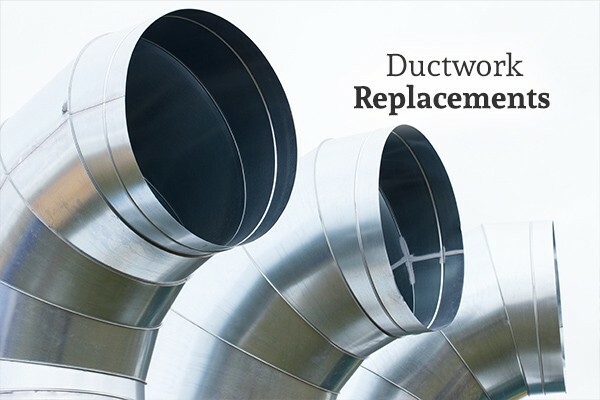 When was the last time your home’s ductwork was replaced? If you’re not sure or if you know it hasn’t been done in well over a decade, then your air ducts are likely due for an upgrade. Each time you have a new HVAC system installed, it’s a good idea to “revisit” the configuration of your home’s ductwork to ensure that everything is set up with maximum efficiency in mind. Unfortunately, many people opt out of having their ductwork upgraded or modified along with their other new HVAC components—and as a result, they miss out on achieving optimal efficiency and comfort. If your ductwork is still original to your home or hasn’t been upgraded in years, now would be a good time to at least have an HVAC professional take a look and make some recommendations. Of course, there are many reasons as to why your utility bills may be too high. You may simply have an outdated HVAC system, or you might have drafty windows or other insulation problems within your home. However, one possibility that you won’t want to overlook is that of outdated ductwork. Oftentimes, leaks in existing ductwork cause warm and cold air to escape on its way to your home’s vents. As a result, your furnace or air conditioning unit needs to work a lot harder to keep your home comfortable. Sometimes, temporarily resolving this problem is as easy as making some basic ductwork repairs (such as sealing leaks). In other cases, however, you may need to have your ductwork replaced entirely to resolve these issues and maximize efficiency enough to reduce your energy bills. Do some rooms in your home seem to be much warmer or cooler than other rooms? If so, then this could also be due to problems with your ductwork. Oftentimes, these issues are directly related to airflow problems caused by the wrong duct size, leaks, blockages, or unbalanced supply of air. For all your HVAC needs, including ductwork cleanings and replacements, contact Cote’s Mechanical Heating & Air Conditioning. They proudly serve the Dallas-Fort Worth area and look forward to assisting you.